As a young man he became involved with political radicalism. In 1797 a small volume of poetry was published, with no author listed, but these poems are attributed to Charles by several outside sources. He was self-educated, learning from his peers, doctors, and scientists, spurred on by his own natural curiousity. His membership in several informal groups brought him into contact with many men with scientific backgrounds, learning chemistry, pharmacy, and galvanism - a term referencing the physiological electricity of animal tissue and using electrical impulses to stimulate tissue, both living and dead. As early as 1804 he was giving lectures in Sheffield on this "New Branch of Philosophy." His study of galvanism, led him to file a patent in 1805 with Charles Hobson, a plater from Sheffield, and John Moorehouse, a surgeon, for a process of coating metals with zinc. This marked the advent of modern galvanized metals, protecting the metal from oxidation. 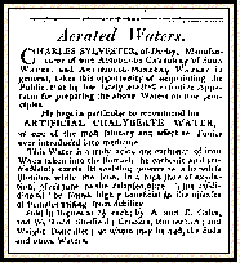 He was also interested in "Aerated Waters" as the advertisement at the right shows. He also did work in the bleaching and dyeing of fabrics and in 1815 brought out a patent "for his invented various improvements in the texture of bobbin-lace." His lectures on galvanism included many demonstrations and experiments, including "the Head and Body of a Sheep will perform all the motions attendant in Winking, Chewing, Breathing, Kicking &c after they have for so time been separated from each other." Though somewhat bizarre, these were considered truly scientific experiments and did lead to an increased understanding of electricity and its properties. A contemporary, Joseph Hunter, wrote: "He is a little uncouth in his manners and not the most happy in his mode of delivery; but altogether is certainly a most extraordinary man, and an honour to his birthplace." His work in chemistry advanced and his scientific methods and experiments were precise and he expected the same precision from others. 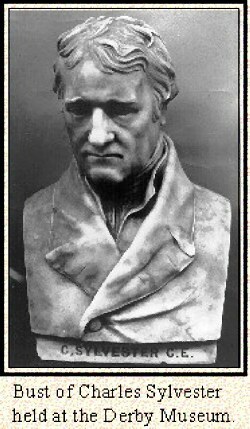 He moved to Derby in 1807 and began teaching chemistry and mathematics. His major patron in Derby was William Strutt (1756-1830). They also became very good friends and collaborators, particularly in the design and implementation of heating and ventilation systems. Their system for the Derby Infirmary was the basis for Charles' 1819 work, The Philosophy of Domestic Economy; as exemplified in the mode of Warming, Ventilating, Washing, Drying, & Cooking, . . . in the Derbyshire General Infirmary. He was the main designer for the warming systems used in the Nottingham General Lunatic Asylum. In 1815 he corresponded with Mr. Macvey Napier, editor of the Encyclopaedia Britannica, giving input for several articles which were included in that publication. He moved to London in 1821, establishing a residence at 60 Great Russell Street, Bloomsbury. He traveled to Bath, Carnarvon, Liverpool, Nottingham, and Derby installing heating systems. He contributed articles for Nicholson's Journal, The Quarterly Review, and The Annals of Philosophy. In December of 1822 Charles's wife of 24 years died in London. He himself was ill from about 1825 until his death in 1828, yet in those intervening years, he continued his scientific studies, expanding his interests to include the emerging technology of locomotive engines. His work with friction was critical in the development of the railroad systems in England. Although he died before the famous Rainhill Trials which determined the type of locomotive engine the railroads would use, his preliminary work helped lay the foundation for this science. On the 15th instant [Januay 1828], at his house in Great Russell-street, London, Mr. Charles Sylvester, formerly of Sheffield [died]. In his peculiar profession as a civil engineer, he had acquired great eminence and extensive employ. His knowledge was extremely multifarious, but not superficial. There is not one branch of science with which he was unacquainted, and in many he was a proficient. He was the authors of a volume on Chemistry; and when resident in Derby, he published an elegant quarto volume connected with the Infirmary there. Some of the best articles in the Encyclopedia Britannica were written by this gentleman. His disposition was kind, friendly, and affectionate; and in private life he was greatly beloved by a numerous circle of friends, who sincerely lament his loss. He has left behind him three daughters and one son [John]--a young man of great attainments in his profession, and fully competent to succeed his father. A more detailed account of Charles Sylvester has been pulished in a 285-page book, Industrial Man: The Life and Works of Charles Sylvester. This was co-written by Ian Inkster, professor of International History at Nottingham Trent University, and Maureen S. Bryson. This book would not have been possible without the years of research Professor Inkster did on the life and scientific publications of Charles Sylvester. His contributions were the core of the final book. Though printed in a very limited edition, a few copies are still available at a cost of $35 plus $5 postage/packaging. Recent contact has been made for the first time, with a descendant of Charles. It has been exciting to finally find long-lost cousins in this family. This book includes all his poetry, the complete Philosophy of Domestic Economy, several other publications and letters. For additional information about the ancestors and related families of Charles Sylvester check the Surnames Index or the recent information (added Sep 2007). E-mail me if you would like more information or are related to Charles Sylvester or his family.